SpanishPod101 offers Spanish reading material in all its lessons. SpanishPod101 offers different options to access Spanish reading materials. 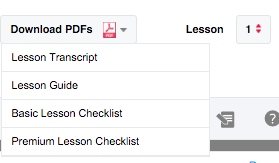 Once you are logged into your personal dashboard, you will be able to find the “Lesson Materials” tab (no. 2) under the Lesson you are taking. Here you will find the “Line-by-line” scripts, the “Vocabulary” used in the lesson, and the “Grammar” tabs. I find it very easy to practice this way. You can even choose form the Formal and Informal forms of Spanish and focus on these differences. But, what if you are away from home or you don’t have access to your computer and you still want to practice? Well, SpanishPod101 offers the option of downloading and printing your Spanish lesson´s PDF. Right above the lesson you will see the “Download PDF´s” box. This will open the option menu. Do you want the whole transcript, the lesson guide or any of the checklists? You can choose what you need and print for later reference or study. This is a great way to review what you have learned. You can practice your pronunciation and go back to the SpanishPod101 dashboard, listen to the Spanish audio and see how you did. SpanishPod101 also offers Flashcards to practice your reading skills. You can access them through the “Study Tools” tab, next to the Dashboard and Browse Lessons buttons. You can either work on the ones already selected for you, or choose “Create New Deck,” select from the hundreds of levels, situations and accents and import them so you can practice what you need. This cards will show on one side the word written in Spanish, and when you flip them over you will be able not only to see the word in both English and Spanish, but to listen to the correct pronunciation in Spanish. In addition, you can subscribe to the SpanishPod101 “Word of the Day” email. It will deliver a daily Spanish word to your inbox along with its pronunciation and some examples. You can also access the “Word of the Day” under the “Spanish Resources” tab, next to the Dashboard and Browse Lessons buttons. 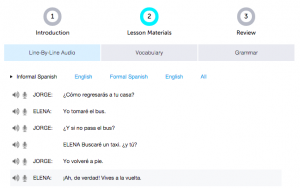 Although SpanishPod101 offers you several options to practice your Spanish reading skills, I wish they would offer more reading suggestions to the students, like books or poems or even short thoughts and sayings. It would be interesting to test our skills reading a longer dialogue or description of some kind.